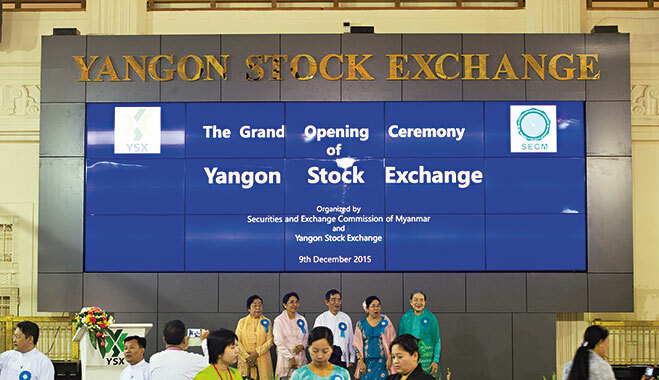 Just up from the banks of the Yangon River, in the heart of Myanmar’s central business district, is the newly opened Yangon Stock Exchange (YSX). The exchange is housed in the former head office of Myawaddy Bank, a neoclassical relic of British rule that is located less than five-minutes’ walk from the iconic Sule Pagoda. A large crowd gathered on December 9, 2015 to mark the exchange’s opening. They were there to celebrate not just the exchange itself, but also what has been widely perceived as a new era in Myanmar’s history. “Until recently, it was generally accepted by the investment community that there [were] two great untapped markets in the world: North Korea and Myanmar,” Aaron Armstrong, Asia Investment Analyst at Alquity Investment Management, told World Finance. Alquity has holdings in Myanmar and so, like many other frontier investors, is particularly excited by the prospect for growth in the country. The country began its transition from a military regime to a democratically-elected government in 2011. 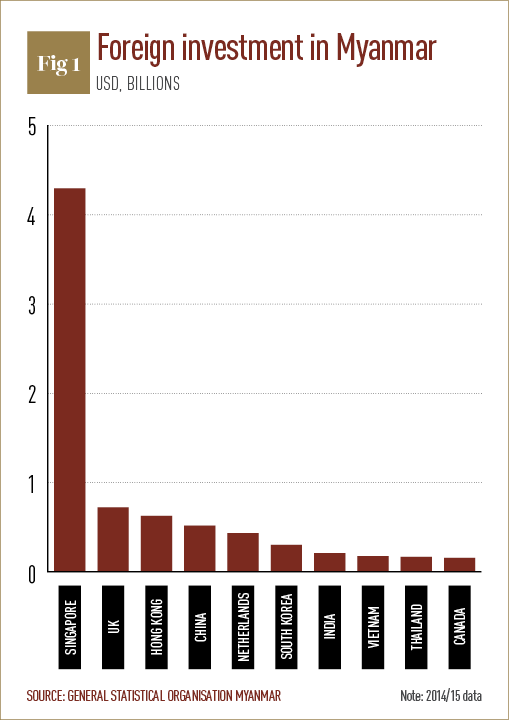 In this time, with a new focus towards pro-business policies, Myanmar has seen foreign direct investment soar (see Fig. 1), jumping from near-nothing to a record $8bn by 2015; a figure double that of the previous year. Although it might be a while before we start seeing Western-owned factories in the heart of Pyongyang, in Myanmar it’s a different story: since 2011, giants like Heineken, Coca-Cola and Unilever have been setting up operations in the country. Unilever is planning on eventually making the country its base for all Southeast Asian operations, having already begun construction on its second factory in nearly as many years. The firm has stated that these operations will bring over €500m ($656m) into Myanmar over the next decade. Under-banked, under-invested and under-urbanised, Myanmar has one of the lowest minimum wages in the world: around $32 per month. This alone makes it a very attractive destination for producers and investors alike. With such a low base to start from, the prospects for growth are enormous, and Myanmar is being eyed up by an increasing number of multi-nationals, including, most recently, Colgate-Palmolive, Mitsubishi and Telenor. Thein Sein’s government has been working hard to attract this interest, inviting infrastructure players in various sectors to set up shop. Nine banks have received foreign banking licenses since 2013, and they will be the first in more than 50 years allowed to offer financial services in Myanmar. Foreign telephone operators have also been allowed in, with Telenor and Ooredoo winning the first round of bids. A stock exchange certainly seems like the logical next step. But is the YSX to be a legitimate endeavour, or just a vanity project? The YSX is certainly a step-up from its predecessor: the Myanmar Securities Exchange Centre (MSEC), an OTC market, was set up in 1996. While it was technically still running until the opening of the YSX, the MSEC was long considered dormant. It had no trading floor and only two companies listed on it (Forest Product Joint Venture Corporation, a semi-governmental timber PLC, and the Myanmar Citizens Bank), and trading was so infrequent that the values of the two companies were manually updated by marker pen on whiteboard. Weeks would go by without a trade, making life easy for the exchange’s eight employees. No new companies had ever attempted to list on the exchange – not even state-owned enterprises – and so most people were completely unaware of its existence. This wasn’t even Myanmar’s first attempt at an exchange: the Rangoon Stock Exchange (RSX) was established in the 1930s and also traded very few stocks. This exchange operated sporadically until 1962, when the military government under General Ne Win nationalised Myanmar’s public companies. Again, few people knew of its existence at the time. Both of these exchanges suffered from the same problem, one that plagues many exchanges in developing countries: they existed not to encourage real trading, but to lend an air of legitimacy to an economy lacking in any autonomy – in the case of the MSEC, an economy under colonial rule, and in the case of the RSX, a military dictatorship. To put it bluntly, the RSX and MSEC were vanity exchanges, and investors understandably took no interest. By 2011, however, Thein Sein’s government had decided that the time was right for another go. To oversee the development, it brought in Daiwa Securities, the Japanese firm that had managed the MSEC, and the Japan Exchange Group, which operates the Tokyo Stock Exchange. With the assistance of these new partners, the Central Bank of Myanmar quickly drafted the Securities and Exchange Law, which officially authorised the exchange, and an estimated investment of between $25m and $30m was poured into the newly created Yangon Stock Exchange Joint Venture Company. It is the involvement of the Japanese Exchange Group that has caught the attention of most investors. It sets the endeavour apart from the exchanges of neighbouring countries Cambodia and Laos, which list only two and four companies respectively and show no signs of growth at all, even after several years of trading. Like the two previous exchanges in Myanmar, these bodies are seen as prestige symbols, but offer very little in the way of serious institutional investment. If there is a local success story that the YSX is hoping to emulate, it would be that of Vietnam’s Ho Chi Minh Stock Exchange (HSX). With more than 300 listed companies and a combined market capitalisation of $19.2bn, the HSX has shown that so-called frontier markets can establish themselves as viable destinations for investors. Myanmar’s Deputy Finance Minister, Dr Maung Maung Thein, has declared that he expects Myanmar’s new exchange to surpass the size of Vietnam’s in the next three years. The best way for this to be achieved would be to allow more foreign ownership of publicly listed companies: a hallmark of a developing country’s stock exchange is weak corporate governance. While frontier investors are used to trading in environments with questionable corporate governance and regulations, having a higher level of foreign ownership would ease the worries of more conventional investors. The YSX does have comprehensive criteria for listing on its exchange under its Securities and Exchange Law, including provisions for the number of shareholders, profitability and paid-up capital. It also includes provisions for good corporate governance and preventing insider trading. Investors will nonetheless be hesitant to invest in the exchange until its companies and trading floor have shown themselves to be stable over the long term, and this leads to possibly the most important lesson the YSX could take from its predecessor and local rivals: the YSX should take care not to rush the rollout of the exchange. Given that this is a time of rapid expansion and growing interest in the country, Armstrong has high hopes for the future of Myanmar’s exchange. But he stresses that it takes time for a stock exchange to find its footing, and there are a lot of factors involved in making it attractive to outside investment. “To begin with, the number of companies listed on the exchange will be very low, and with low liquidity,” he explained. “Questions of the quality of the listed companies, in terms of governance and standards, will need to be seriously considered, as the country is only getting its first real taste of corporate operations [in more than 50 years].” Armstrong also cautioned that turning all six of YSX’s initial companies out at once would overload the market and not allow proper time for vetting. Indeed, launching the stock exchange too soon would run the risk of confusing an already apprehensive investor market. Without proper guidance and a measured rollout, experts worry that corporate governance will suffer, as companies not accustomed to long-term growth will look to cut corners in order to raise their list price in the short term. Sanctions are another real obstacle standing in the way of success for the YSX. Many have already been lifted, or are in the process of being lifted, in the wake of democratic reform, but it is expected that many former military officials will retain positions of power in Myanmar’s private sector. Most notably, the Myanma Economic Bank – the majority shareholder in the exchange – remains sanctioned by the US Treasury Department’s Office of Foreign Assets Control, as do several securities companies looking to eventually list on the exchange. Institutional investors will naturally be hesitant to commit to the market under this climate, though it is hoped that the incoming government of Aung San Suu Kyi – herself kept under house arrest by the former military government for over 15 years – will signal the lifting of many more sanctions, when Suu Kyi’s National League for Democracy (NLD) successfully wrestles control of Myanmar’s economy away from the old guard. Progress is already being seen, as the US recently suspended sanctions against Myanmar’s ports and airports in an attempt to encourage the NLD’s progress. If these obstacles can be surmounted, there is great potential in the YSX. With a measured rollout of properly vetted companies, it could well achieve its goal of rivalling Vietnam’s success and play a part in Myanmar’s larger economic growth story – once trading actually begins, that is.